Publisher: LORIMER & COMPANY LTD.
Martin wishes that everyone would quit calling him stupid. Just because he isn’t on the honour roll like his younger sister doesn’t mean he’s stupid. No matter how hard he tries, Martin just can’t seem to improve his grades at school. Martin’s father constantly belittles him; calling him lazy and stupid. As it would with any teenager, this devastates and frustrates Martin. Out one night videotaping he captures surprising video of someone jumping from roof to roof at an abandoned brewery. When security spots the person on the roof, the two teenagers team up to help each other escape. From that night on, Martin and Stick becomevgood friends. Asking Stick what he had been up to that night introduces Martin to the world of parkour (free running). Seeing correlations between Stick’s jumps, flips and tricks and the way words move around the page when he tries to read, Martin decides to make a movie that will prove he isn’t so stupid after all. I love the fact that this book addresses issues that other authors are afraid to take on – like the fact that parental verbal abuse can be as bad (and sometimes worse than) physical abuse. Additional topics talked about in very realistic ways include: learning disorders, dyslexia, ADHD, the foster system, the sale of ritalin in high schools, depression and the frustration of giving something your absolute best effort and still coming up short. If a reader cannot find a way to relate to either Martin or Stick then they must have been brought up in complete isolation from others. This is the second book I have read by KIM FIRMSTON and I am now officially a fan. I love the realism in her books and I love that she is not afraid to bring up hard topics. Her books are perfect for Young Adult Reading Groups and in fact, I think that it sbould be required reading for parents of teenagers. * I received a free paperback copy of this book from the author but this in no way influenced my rating or my review. All opinions are 100% my own and 100% honest. I am looking forward to reading Kim Firmston’s next book called BOILED CAT which is to be read while also experiencing it’s website at the same time. It sounds like a lot of fun. (Don’t worry, its not a horror. BOILED CAT is the name of a rock band. WHO is this so called KIM FIRMSTON? Kim says she is a real life mutant – though one without any cool powers. When she is not writing or cursing obvious villain mistakes, she warps young minds in her Reality is Optional Creative Kids’ Programming, at WordsWorth Writing Camp and through the ACS Dramantics Theatre Camp, among other places. Her short story, Life Before War, was short listed in the 2008 CBC Literary Award and published in FreeFall Magazine. Returning Home, was published in the Alexandra Reader Anthology. Her children’s plays (many of which were co-written with children) have been produced across North America, the Calgary Fringe Festival, and as far away as the UK and Egypt. She has published six YA books which can be seen here, has been the Writer in Residence for Open Book Toronto, toured Labrador as part of TD Book Week, and was even interviewed on CJSW. Kim is dedicated to sharing writing with children of all ages including those not able to write yet and promoting youth who wish to make it their career. Dan and his little brother Dustin live in a single-parent household. Dan is a fifteen year old boy who is just trying to live his life. He has all the normal teenage concerns and desires. There is a girl he really likes and his favourite thing to do is to play his base guitar. BUT there is one thing that distinguishes him from the rest of the kids at his high school and it is so time-consuming and so emotionally draining that he is exhausted and sleep-deprived every single day. This is obviously affecting his grades. The difference between Dan and his friends is his mother. She isn’t like the mothers that his friends complain about. They all think their mothers are psycho and complain about them bitterly. If they only knew! They may call their mothers “psycho” but they have no idea what life is actually like with a mentally ill mother. Dan’s mother is a schizophrenic and she has recently stopped taking her medication. This makes her unpredictable and can lead to her becoming violent. Dan is doing his best to hold his family together and to protect his brother. But soon things begin to spiral out of control. Will Dan be able to keep himself and his brother safe? Or is his mother’s schizophrenia going to tear the family apart? WHEW!!! What a book. I started reading and couldn’t stop. I read the entire book in a single sitting. Author Kim Firmston should be applauded for writing a book that directly tackles the issue of mental illness. Unfortunately, even though we are making progress in bringing the issue of mental health out of the shadows, there is still a long way to go. Dan makes a great point. Schizophrenia is an illness, and until people start to believe that, things will not really change. Talking about it and having books like this one available is an important step towards understanding. As ridiculous as it seems to those of us who are aware that mental illness is NOT a choice, there is still a large segment of the population that believes that everyone can choose how they act and react. This needs to change. 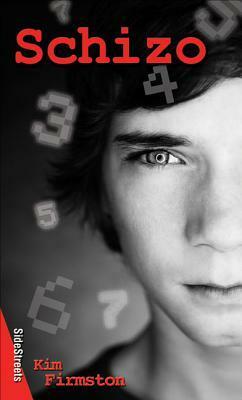 I highly recommend it to teens and other young adult readers. It is especially important that books like this are available in all high school libraries so that they are easily accessible to those who need them. If this book reaches just a single young adult and makes him or her feel less alone then it has done its job. Thank you to Canadian author Kim Firmston for providing me with a free copy of this book.